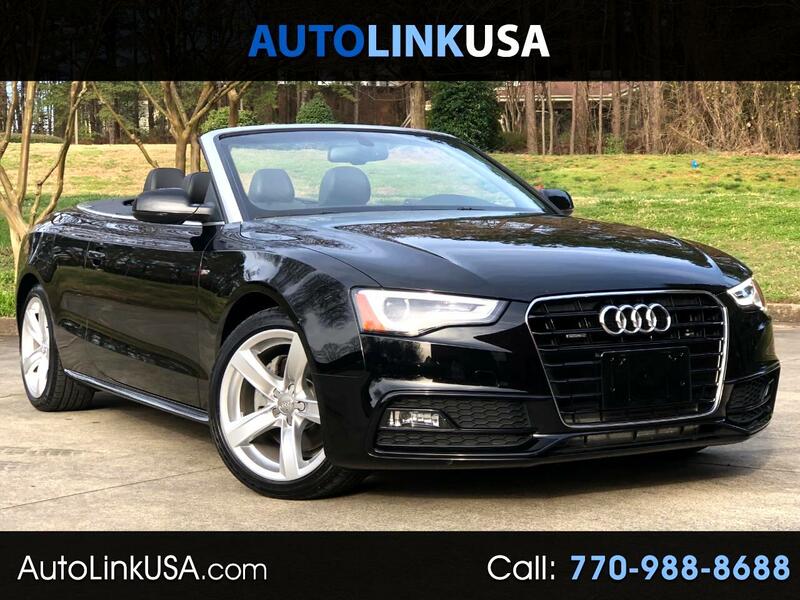 ONLY 25K miles, Premium Plus-, Tech.- and S Line Sport Pack., 18 inch 5-arm Dynamic Design Wheels, Side Assist (Blind Spot Monitor), Navigation, Parking System with Rear View Cam, Audi Advanced Key (Comfort Access/Keyless Go), Sport Suspension, Audi Drive Select, Dual Power Heated Sport Seats with Lumbar Support, Driver Memory Seat, Bang & Olufson Prem. Stereo, HD Radio, CD, Satellite Radio, Bluetooth, Tilt and Telescoping Leather Steering Wheel with Paddle Shifters, BRILLIANT BLACK with BLACK Leather, BLACK Convertible Top, Aluminum Interior Trim, Auto Leveling HID Headlights. The car is it is in PRISTINE condition and under 4 years/50K full factory warranty. We offer GREAT FINANCING rates and take TRADE-INS! For a FREE report or any questions you may have please visit our website http://www.autolinkusa.com or contact us by phone (770)988-8688 or by email info@autolinkusa.com.